Negroland’s pedigree dates back generations, having originated with antebellum free blacks who made their fortunes among the plantations of the South. It evolved into a world of exclusive sororities, fraternities, networks, and clubs—a world in which skin color and hair texture were relentlessly evaluated alongside scholarly and professional achievements, where the Talented Tenth positioned themselves as a third race between whites and “the masses of Negros,” and where the motto was “Achievement. Invulnerability. Comportment.” At once incendiary and icy, mischievous and provocative, celebratory and elegiac, Negroland is a landmark work on privilege, discrimination, and the fallacy of post-racial America. The winner of a Pulitzer Prize for criticism, Margo Jefferson was for years a book and arts critic for Newsweek and The New York Times. Her writing has appeared in, among other publications, Vogue, New York magazine, and The Nation, and Guernica. 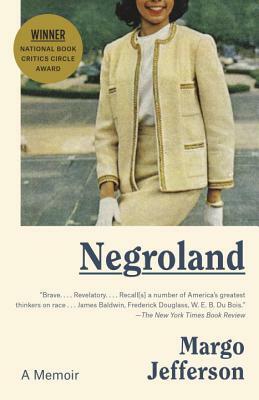 Her memoir, Negroland, received the National Book Critics Circle Award for Autobiography. She is also the author of On Michael Jackson and is a professor of writing at Columbia University School of the Arts.